She's got a thing for green tooo! 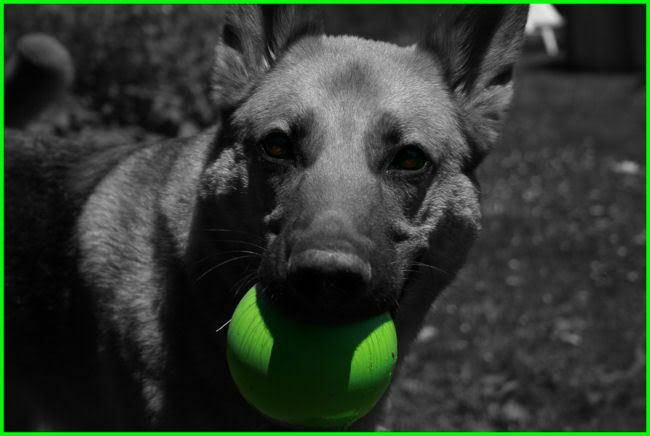 Nice selective color......Boy is that green !! I am not on my on puter at the moment so I can only comment on the composition. Right, I like the position of the dog within the frame except for the fact you have cut the ears off!! There is also a white mass near its left ear that catches the eye and could do with cloning out. From what I can see colour wise on this screen the green is nice and bold. did you guys notice I sorta coloured her eyes too!? thanks for the C&C stewart..I'm learning lots on here!